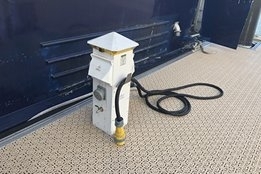 Cold ironing, the practice of an at-berth vessel plugging in to shore power, could soon become standard procedure, according to DNV GL. "There is an increasing awareness of the impact of shipping emissions in ports and this is driving investments in cold ironing," says Jon Rysst, Senior Vice President and Regional Manager North Europe, DNV GL. "This is leading to ports both requiring and incentivizing the use of alternative maritime power (AMP). As access expands, alongside the rise of fully electric and hybrid vessels, cold ironing could soon become standard procedure in many ports around the world – with a noticeable positive impact on air quality." Having been written off in 2015 by the South Carolina Ports Authority as "a last-generation solution at most major ports," tightening environmental legislation means interest in the technology has remained strong. Only last month, the Port of Rotterdam said it was looking to develop a shore power system on an "industry first" scale. Plugging into shore power while at berth allows vessels to switch off their engines and draw power from the local supply grid, reducing emissions associated with the vessel itself. DNV GL's comments came alongside news that the K Line Offshore AS vessel KL Sandefjord is the first offshore vessel with its class notation Shore Power. The notation verifies the design and installation of a vessel's on-board electrical shore connection. Vessel operated by UAE interests.